It’s a quiet Sunday morning as I roll through downtown Dillsboro, N.C. I’ve come to take in the sights of this historic railroad town on the banks of the Tuckasegee River before following that ancient waterway upstream to a series of mountain lakes. On a side street across from the iconic balconies of the Jarrett House, I pause for some people watching and to plot my route. As I hang up my helmet and begin to take a stroll, a voice calls out from nowhere; “Is that a V-Strom?” Puzzled — by both someone noticing my treasured-but-nondescript Suzuki and the voice coming from the porch of one of the town’s charming white clapboard houses — I eagerly answered. The motorcycle-savvy observer turns out to be Jimmy Cabe, a Dillsboro native and town alderman. Cabe warns me I’ve parked the bike in a spot where a Pokemon lives and some obsessed player might knock my bike over trying to catch them all. 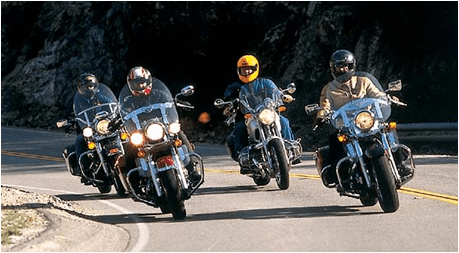 When we both stop giggling about this absurd new trend, Cabe happily chats about motorcycles, drawing my admiration when he mentions a Kawasaki Z900 he once owned and finding out we shared the same ’70s motorcycle racing heroes in our youth. Dillsboro’s fortunes rose and fell with the age of the railroad, but today it largely draws tourists looking to enjoy fine Southern cooking at the Jarrett House, tasty barbecue at the Haywood Smokehouse or delicious Greek and Italian fare at Kostas Family Restaurant. 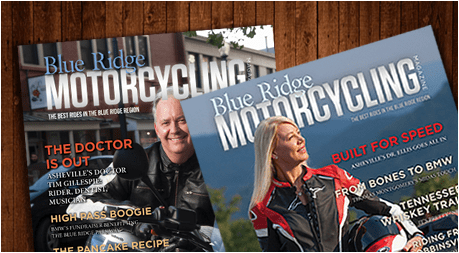 Local motorcycle riders always know the best routes, so I inquire about North River Road since I intend to follow the Tuckasegee River to its headwaters. Cabe quickly approves and gives me that knowing look fellow riders often exchange when they talk about nice motorcycle roads. 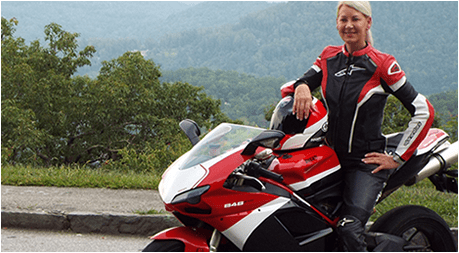 Dillsboro’s central location in Western North Carolina makes it ideal for day excursions to the Blue Ridge Parkway, the Tail of the Dragon, Moonshiner 28, Nantahala Gorge and other great locales. On this day, the river quietly flowing past the town has my attention. Rivers were traditionally the main way to access the wilderness of the mountains. Railroads and wagon tracks followed. So knowledgeable motorcyclists know that where a river flows, a curvy road probably parallels it. Before reaching the confluence of the main branch of the river with West Fork Tuckasegee on N.C. 107, a side road leads to Judaculla Rock, the mysterious and enigmatic Indian petroglyphs just south of Cullowhee. History buffs will enjoy the informative signs detailing the legend of Judaculla the giant, who leapt from Devil’s Courthouse and imprinted his six-fingered hand on the rock when he landed. The western tributary flows out of Lake Glenville, a worthy motorcycle destination itself, but I’m heading up the main tributary to enjoy the hidden gem of a motorcycle route known as Canada Road, N.C. 281.This lightly traveled road climbs up along the river to a series of manmade lakes built by Nantahala Power & Light in the 1950s. As you ascend N.C. 281, Cedar Cliff Lake appears in the gorge below, fed by Bear Creek Lake, Wolf Creek Lake and Tanasee Creek Lake. The road curves alongside with enough twisties to be fun without being too difficult to handle.The lakes and their hydroelectric dams, now operated by Duke Energy, feature boat ramps, fishing piers and restrooms, making them a perfect spot to stop the bike and enjoy the scenery. 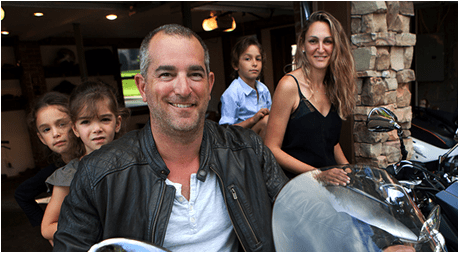 Summer sees recreational boaters and fishermen in these out-of-way bodies of water, but during the off-season, motorcyclists can enjoy a secluded lake with only the sound of a gentle breeze against the mountainside. After a peaceful sojourn by the spillway of Wolf Creek Lake, the road beckons onward and upward. With no other traffic to contend with, I fall into a nice, swaying rhythm as the curves unravel beneath me. A break in the trees offers glimpses of the high mountains across the next ridge. Leaves float down and gently brush my helmet as if to confer a blessing for this ride. N.C. 281 continues past the four lakes to crest the Eastern Continental Divide. Behind me the tributaries of the Tuckasegee flow toward the Ohio and Mississippi rivers, ahead the small creeks and streams run down to Lake Toxaway and eventually the Savannah River. Cresting the summit, I slow a bit. There’s no rush. For like this river, everything flows toward its ultimate destination in time.